With the greater efficiencies of digital, the overall “pie” will shrink because fewer dollars are needed to achieve the same effect. In other terms — for every DOLLAR pulled out of traditional and general advertising, 20 – 50 CENTS is put back into “digital” channels and tactics. Thus the overall pie will continue to shrink while some parts grow and other parts shrink dramatically. Ad pages also declined in Q1 2010 compared to Q1 2009, falling 9.4%, according to the Publishers Information Bureau (PIB). Total US TV and online advertising revenues dropped 12% in 2009, although online revenues independently grew, according to research from The Yankee Group. In 2009, the total US TV and online advertising market totaled $67 billion, compared to $77 billion in 2008. TV advertising, by far the largest portion of this combined market, was hit especially hard by reductions in spending during 2009. The TV ad market declined 21.2%, from $52 billion to $41 billion, between 2008 and 2009. This was significantly more than the 4% (or roughly $2.1 billion) decline The Yankee Group originally forecast in June 2009. As highlighted below, a shift in consumer attention primarily drove the steep decline in the TV ad market. Internet advertising grew during 2009, as a result of consumers spending more time online and less time watching TV. Online ad revenues grew 8.3% between 2008, when they totaled $24 billion, and 2009, when they totaled $26 billion. The total amount of time consumers spent on media per day actually declined 14.3% between 2008 and 2009. 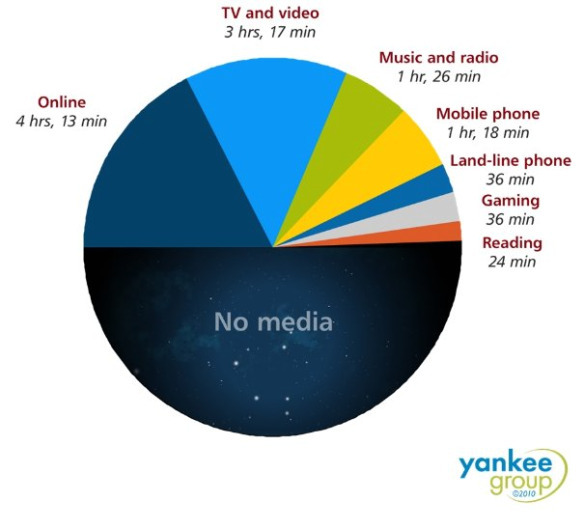 Consumers spent about 14 hours per day on media in 2008, but only 12 hours per day in 2009. Most of the decline in media consumption was represented by declining TV viewership. Americans spent an average of three hours and 17 minutes per day consuming TV and video in 2009, compared to an average of four hours and 13 minutes a day consuming online content. In addition, average daily mobile phone use reached one hour and 18 minutes. Thus Yankee Group advises marketers and advertisers to increase their focus on online and mobile promotions. Total US advertising expenditures (including print, radio, outdoor and free standing inserts) fell 12.3% in 2009, to $125.3 billion, as compared to 2008, according to Kantar Media. Some of Kantar’s findings echo findings from the Yankee Group. Internet display advertising expenditures increased 7.3% for the year, aided by sharply higher spending from the telecom, factory auto and travel categories. Meanwhile, spot TV advertising fell 23.7%, Spanish language TV advertising dropped 8.9%, network TV fell advertising 7.6%, and cable TV advertising only fell 1.4%.